MAXIM Integrated Products, represented by Arrow Electronics , has introduced the MAX7044, the world's smallest VHF/UHF, PLL-based, ASK transmitter. With +13dBm output power the MAX7044 is packaged in a tiny 3mm x 3mm, 8-pin SOT23. This transmitter is ideal for low-cost, high-volume applications where space is critical. Examples include key-fobs, security products, garage door openers, and remote sensors operating in the 300MHz to 450MHz band range. The MAX7044 uses a simple, single-input data interface and a clock-out feature to eliminate the need for an MCU resonator. The device operates from a single lithium-ion (Li+) cell down to 2.1V and consumes only 100 microamps of current in standby mode. Using an external resistor, the output power can be adjusted from -10dBm to +13dBm into a 50 ohm load. At +13dBm, the MAX7044 consumes 8.6 microamps of current at 315MHz, when using a 50% duty-cycle encoding scheme such as Manchester. Current consumption is only 3.7mA at 0dBm output, and the device can transmit at date rates up to 100kbps. Once enabled, the MAX7044 takes only 250 microsecond for the PLL and crystal to settle and be available for transmission. The device accepts crystal frequencies between 10MHz to 15MHz, widely available in inexpensive, surface mount packages. 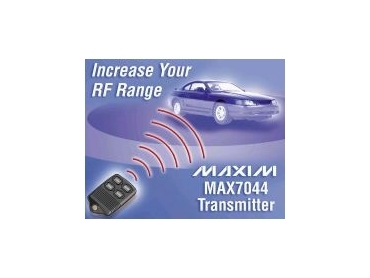 The MAX7044's crystal-based PLL eliminates most LC- or SAW-based transmitter problems. The inherent accuracy of the crystal frequency facilitates a narrower IF-bandwidth in the receiver to improve system sensitivity. A sensitivity improvement of 9dB is possible by narrowing the IF bandwidth from 600kHz to 50kHz when the device is used in conjunction with receivers such as Maxim's MAX1470, MAX1473, or MAX7033. Improved sensitivity enables reliable transmissions and an increase in range. The MAX7044 is specified for the -40°C to +125°C automotive temperature range. An evaluation kit is available to speed designs. Crystal reference samples are available upon request.